The Boston Harbor Islands Alliance and the architecture firm Utile, which designed the Boston Harbor Islands Pavilion on the Greenway, invited the museum to present a video program on the pavilion’s two 8-by-10-foot LED screens. . . . “Nature Special’’ engages viewers on several levels. 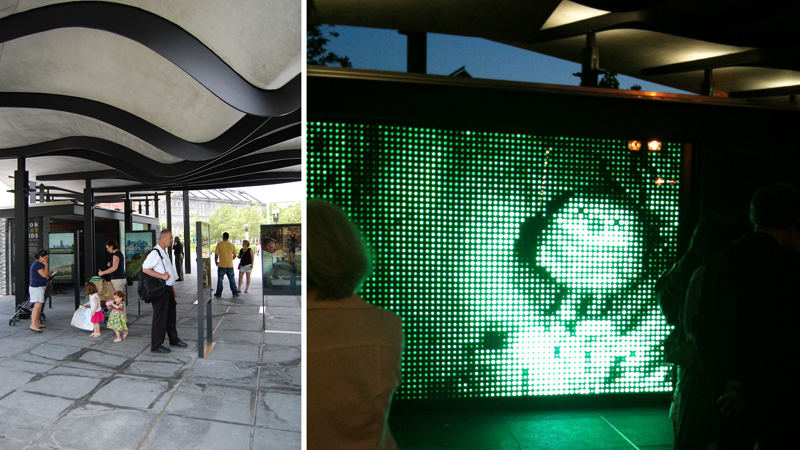 Because the videos–by Jim Campbell, Suara Welitoff, Sam Easterson, and William Lamson–are on pixellated LED screens, they’re easy to read from a distance, and images grow more abstract as you get closer. They activate the space around them. Campbell’s low-resolution “Grand Central Station’’ features shadowy pedestrians, echoing those crossing the Greenway. Welitoff’s gorgeously slowed-down “Kiss’’ spotlights two hovering hummingbirds, their wings rotating in a flurry of abstract gestures. Easterson’s “Burrowing Owl’’ makes direct eye contact with the viewer, veritably inviting us into its lair [above right]. Lamson’s “Emerge’’ is lighthearted, with colorful balls popping to the surface of water and drifting into the air–on the LED screen, it’s marvelously abstract.